How many calories in Swordfish? See below, the Swordfish calories for the different serving sizes. We provide you with Swordfish nutrition facts and the health benefits of Swordfish to help you lose weight and eat a healthy diet. Swordfish, so called due to their elongated bill shaped like a sword, are generally purchased as steaks, which can be fried or grilled. If you are on a weight loss diet, it’s best to grill. 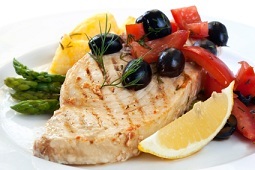 Swordfish provide an excellent source of vitamins D and B3 (niacin). Other vitamins and minerals provided include B1, B2, B5, B6, B12, E, magnesium, phosphorus, potassium and selenium. They are also full of protein. 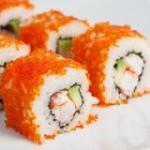 Due to their omega-3 content, they are believed to help protect against heart disease. Other Swordfish benefits include helping to maintain a healthy weight as they are low in calories, and also helping to protect against arthritis. According to the US Food and Drug Administration (FDA), pregnant women or women who are planning to become pregnant, and children, should avoid Swordfish due to possible high concentration of mercury. Compare calories in Swordfish with the other calories in fish. Scientific Name: Xiphias gladius L.